Building All Children had the honor of partnering with a church that served their community one last time before summer break. It was a beautiful example of being “the Church.” This church organized a day for people in need to come to their church to receive various items for free. The church knew that these families needed household items, clothing, food, and even Bibles. 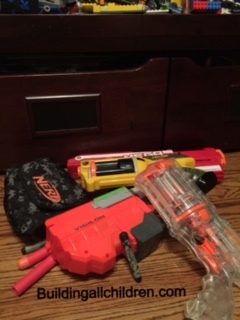 There were several families who received different items, but there was one little boy who had his eye on a Nerf gun… Scripture tells us to not to harden our heart or shut our hands against those in need. This church opened its heart and hands. But I had no idea how open my heart would become…. This 4-year-old boy ran across the room and quickly grabbed a Nerf gun. Full of excitement, he held it up and screamed, “Mom, look! I’ve always wanted one of these!” The mom looked up at him, and she said, “There are no bullets.” He quickly replied, “It’s okay. I don’t need bullets.” My eyes filled with tears. This little guy was so excited to just get a Nerf gun…no bullets needed. Content. He was content with what was given to him. His ability to be content spoke to my heart. Are we teaching our children to be content? Or are we teaching our children to want more, and expect more? I have picked up so many Nerf bullets. I have swept them up, the dogs have eaten them, and I have even complained about them being all over the house! I will never look at a Nerf bullet the same way!! Seeing one will remind me that God wants His children to be CONTENT and GRATEFUL in every situation! I’m thankful for this sweet four-year-old boy. He has taught me to be more content.